While the Amazon boss's hefty donation is welcome, the company has been a factor in the social problems that Bezos is now trying to address. Amidst rising inequalities and the degradation of hard-won social rights, the ultra-rich salvage their conscience through philanthropy and charitable donations. The latest billionaire to do so is Jeff Bezos, founder, chairman and chief executive of Seattle-based online retailer Amazon. Bezos is estimated to have wealth of more than $150 billion and has promised to donate $2 billion to fund “existing non-profits that help homeless families, and creating a network of new, non-profit, tier-one preschools in low-income communities”. The $2 billion represents just over 1% of Bezos’ wealth and considerably less than the taxes avoided by Amazon. This donation comes after Amazon played a key role in defeating a tax by Seattle Council designed to reduce homelessness in the city. Philanthropy is always welcome, but Amazon has been the author of the social problems that Bezos is now trying to address – homelessness and the state’s inability to develop institutional structures to address that. Amazon provides jobs but at a price. Harsh working conditions have been reported throughout Amazon’s operations across the world. 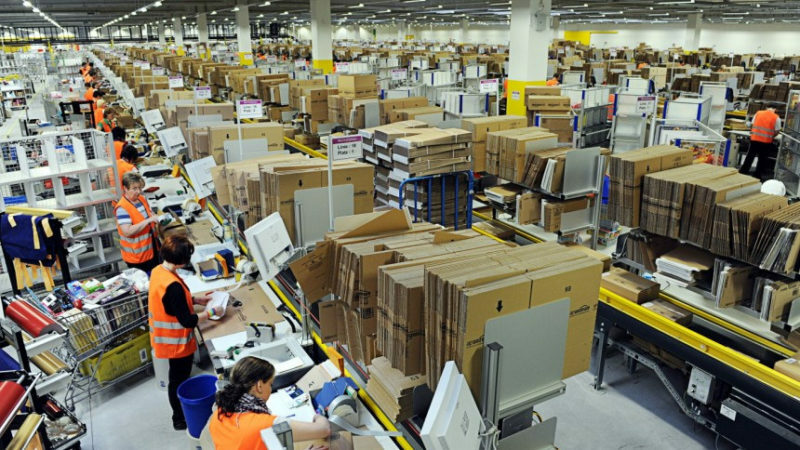 James Bloodworth, former editor of Left Foot Forward, took an undercover job at Amazon’s UK operations and reported that employees often worked ten and a half hour shifts. Employees had to march up and down the long narrow aisles picking customer orders from two-metre-high shelves. Over the course of a single day a picker could walk as far as 24 kilometres. Amazon also operated a disciplinary points system which penalised workers for illness and for taking toilet breaks, though it now claims to have abolished such penalties. Employees received the minimum wage and many probably have to rely on food-banks and welfare support to make ends meet. Amazon employees have been the subject of relentless robotic surveillance and targets. One undercover reporter was told to pack 120 items an hour and that target was set to rise to 200 items. A number of workers who could not cope with the relentless targets were attended to by ambulance crews after they collapsed on the job. Some call centre workers sought to unionise. Amazon responded by shutting down the call centre. Low wages have enriched Amazon executives and shareholders and sent the share price rocketing, but have also disabled many employees and their families from living fulfilling lives. People may seek help from the state, but Amazon avoids taxes and deprives the state of much needed revenues. Amazon has been a serial tax avoider. Its global revenues for 2017 topped $179 billion and generated profits of over $3bn, but it paid virtually no corporation tax in the US. Due to complex corporate structures and profit shifting through intragroup transactions, Amazon’s profits in various countries are difficult to ascertain from its annual accounts. Most recently, it is estimated to have paid UK corporation tax of £1.7m on profits of £72.3m. In 2016, Amazon is estimated to have paid €16.5m (£15m) in tax on European revenues of €21.6bn (£19.5bn) reported through Luxembourg. Through the ballot-box people can mandate the state to improve social welfare, but companies like Amazon exercise the ultimate veto i.e. they do not pay taxes and billionaire’s like Jeff Bezos end-up negating democratic choices. While unresponsive governments can be voted out of office, people can do little to check corporate power. Acts of philanthropy may earn some applause, but they cannot provide the systematic basis for tackling social problems. It takes years to train doctors, nurses and teachers; build hospitals and schools and a vast organisational structure to operate them. It takes considerable time to plan and build houses and related infrastructure, or provide institutional framework to eradicate homelessness. This requires responsive institutional structures and a steady supply of finance. No government can commit to a long-term programme of education, healthcare or house building on the basis of philanthropy of billionaires. If the mood of the billionaire changes and s/he halts donations, all that is built upon charity will inevitably collapse. The charitable whims of billionaires do not provide the durable basis for building institutional frameworks necessary for eradicating social problems. Despite all its contradictions, the state remains the major institution capable of responding to citizens’ demands and building durable institutional structures to address social problems. Yet its capacity to act is routinely undermined by companies like Amazon. If Bezos is really serious about addressing social problems then he does not have to look far. Amazon could develop policies for more equitable sharing of wealth. It should increase wages and improve working practices. To ensure that workers’ perspectives inform company decisions and halt exploitative practice, Amazon should have workers on its board. It can stop shifting profits and pay taxes where the revenue is generated. In an ideal world, wealthy elites would reflect on the links between social problems and their intoxication with private wealth, status and power. Alas, there is little sign of that. Prem Sikka is Professor of Accounting at University of Sheffield and Emeritus Professor of Accounting at University of Essex. He tweets here.